Hello! Thanks for visiting and please enjoy the free info below! Just fyi, you can find me over at www.dorisfullgrabe.com from now on, where I'm making custom lettering and calligraphy. This archive will be discontinued next month. 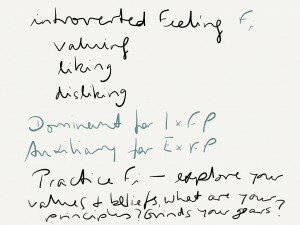 You are using introverted Feeling or Fi when you're deciding whether you like or dislike something. When you're running something past your internal set of values. When you're calibrating your moral compass. Thinking about our vocalizing your sense of deeply held beliefs and universal truth. People with a dominant Fi function cannot not operate from a sense of congruence. They may not force others to see the world in the same way, and theymay not speak up about something if it's not deemed worth it. But if it is, they may surprise you, and you will notice when you violate their values. Expats using Fi to decide on an assignment may need time to feel through all the aspects and how they align with what is important to them. "Are you willing to accept a break in your career to support that of your partner? What difference is the international experience going to make to your life? Is it worth it?" It is helpful here to allow the necessary time to align universal themes like how the relocation process is supported or how the new country has been portrayed in the media lately, with individual values like "will I be able to express myself freely and authentically in the new country?" If Fi is in a different positions in your type dynamics, below is an overview pieced together with only a few items taken from Understanding Yourself and Others, An Introduction to the Personality Type Code, by Linda V. Berens and Dario Nardi. Let me say this again to be very clear: the description of how Fi can be expressed in the different positions is not exhaustive and only meant to give you an overview. I would love to have you comment below how it shows up for you. If you'd like to practice your Fi skills, do a values exercise to see what's important to you. Divise an action plan of how you can bring more of those values into your life through your thoughts and actions. Out of the following list, select those values which according to your own definition of the word most accurately reflect what is important to you. If you don’t see your value on the list, please add it. Note your Top 10 values in no particular order. Using the numbers from the list above, compare each value to every other value. In each cell of the table below, circle the number of the value that feels more aligned with who you believe you are. Between Harmony and Financial Security, Harmony is more important - circle 1. Between Harmony and Family, Family is more important - circle 3. Between Harmony and Autonomy, Harmony is more important - circle 1 again. Count the number of times each number is circled. The value with the highest number of circles is your top priority, subsequent lower numbers of circles represent values of subsequently lower importance. This will give you your Top 10 values in order of your priority. If any of your values have the same number of circles, go back to the grid and find the box where you compared them. The number you circles in that box is the higher ranking value. Start with your top 3 or top 5 and ask yourself: how are your daily values reflecting your values? How aligned is your life with them? If family is coming out on top, how many times a week do you have dinner together? When was the last time you visited your parents?